The Bulls apparently are about to introduce the next Big Three: Joakim Noah, Taj Gibson and Pau Gasol. Not two, not three, not four, not five, not six, not seven… wins hopefully by Thanksgiving. Gasol, 34, the four-time All-Star who vied with Dwight Howard four years ago to be considered the league’s best center when he helped the Los Angeles Lakers to a pair of NBA titles, announced on his web site Saturday he was signing with the Bulls as a free agent. “After much thought and meditation, I decided to join the Chicago Bulls. I am very pleased to have the opportunity to be part of a franchise (with so much) tradition and play on a team with many aspirations, with such passionate fans. “Although I see a promising future for me in Chicago, deciding to leave Los Angeles has been one of the hardest decisions I’ve had to make. In my seven seasons with the Lakers, three times we have reached the NBA Finals, having managed to become champions twice. I am very grateful to have coincided with one of the great players in the history of the NBA, Kobe Bryant, and other great companions; and to have had the opportunity to be under the command of one of the best coaching, Phil Jackson, and his technical team. I am also happy to have played in a franchise with one of the best owners in all of sports, the Buss family. Still, I realize that the Lakers are under reconstruction. No doubt that in the future again be contenders ring. Unfortunately, the immediate needs of the Lakers do not match mine. All the best to the team and their fans. The move for Gasol also apparently concludes a Bulls pursuit of Carmelo Anthony, whom media reports Saturday indicated was prepared to resign with the Knicks. Anthony was said to be deciding in the end between the Bulls and Knicks. Meanwhile, reports are the Cavs will change a reported offer in an attempt to acquire Kevin Love from Minnesota by dangling No. 1 overall pick Andrew Wiggins. The Bulls were not able to make an announcement regarding Gasol because the signing isn’t yet official. It is expected Gasol will sign for three years, but the amount remains in question and is estimated at anywhere from $6 million to $10 million annually. It will depend on whether the Bulls can make any trades to create more salary cap space (they apparently did with Greg Smith Saturday to Dallas) and the fate of other potential additions, like Nikola Mirotic from Spain and whether there will be an amnesty or sign-and-trade or trade of Carlos Boozer in the next week. Bulls coach Tom Thibodeau at summer league wasn’t able to speak about Gasol since the signing remains unofficial despite Gasol’s statement. Though Thibodeau and management were silent regarding Gasol, the players were more candid. The addition of Gasol is a help to the Bulls as it gives the Bulls likely the premier front court in the NBA–and a Very Tall Three–with Defensive Player of the Year Noah, Sixth Man runner up Gibson and the seven foot offensive minded Gasol with a career average of 18.3 points and 9.2 rebounds on 51.5 percent shooting. The Bulls had a strong flirtation in a potential trade for Gasol in 2007, but balked about including Luol Deng in the deal. At the time, Gasol was with Memphis and 0-12 in playoff games. Though Gasol’s addition is a positive for the Bulls given he was pursued by the Spurs, Thunder and Knicks and reportedly offered as much as $27 million for three seasons by the Lakers, the simultaneous disappointment was Anthony’s desire to return to the Knicks. The Bulls made a strong presentation and Anthony was intrigued, but it always was considered a long shot. Even after Anthony was hosted by the Bulls, associates close to him estimated the Bulls chances less than 50/50. That’s because of the substantial difference in potential salary between the Knicks’ ability to offer about $125 million over five years and the Bulls closer to $75 million over four. Though the narrative was depicted as Anthony going for on court success or off court riches, Anthony was said to be equally concerned about making a long term commitment to the Bulls given the injury histories of Derrick Rose and Noah. Anthony saw his chances with the Knicks limited with injury to Amar’e Stoudemire. Plus, the addition of Phil Jackson to the front office, some recent personnel moves and the chance for substantial salary cap space next summer helped persuade Anthony the risk was too large to leave New York, where his family preferred to live. And Anthony was having second thoughts of not having a legacy city and going to a third team after LeBron James returned to Cleveland. There always has to be intrigue in these things. And there may have been in the James/Anthony recruitments as well because of the timing. There was some question about why the decision making lasted so long given, especially James, seemed to know weeks ago what he wanted to do. The talk around James supposedly was that James wanted to try to avoid a repeat of what he did in 2010. Not the TV show or rally, but the uniting of too strong a force. James wanted to remain in Cleveland in 2010, but he failed in several efforts to attract free agents, including Chris Bosh. So James understood he had to leave to win a championship, but he wanted to do it as quickly as possible. Thus, the merging of the three All-Stars with Dwyane Wade. They’d get to the Finals the first season and win twice. James understood going back to Cleveland was no such uniting even with the talented Kyrie Irving. Though he also knew that roster still was better than Miami’s with the injury decline of Wade. So, the rumors go, James held out as long as he could to try to have as many teams and players make prior commitments. Thus, it would be too difficult for teams to do sign and trade deals or have multiple players form alliances with one team like he did in Miami. That’s why that uniting went more quickly back in 2010. The scenario is perhaps apocryphal, though with Anthony returning to New York and Houston losing out on Bosh, there are no so called super teams left that could be a formidable roadblock to a Finals return for James. And Gasol didn’t want to fight the roadblock to the Finals in the Western Conference, which aided the Bulls cause. It is a Big Three for the Bulls, though concentrated on the interior, which while providing the sort of strength the Bulls had in 2010 and 2011 with Noah, Gibson, Boozer and Omer Asik, it also raises many questions that should make it an intriguing season. The Bulls should still have enough salary cap room to make an offer to Mirotic, though he’d likely be marginalized at first given the Bulls will have three starting big men for two positions. The assumption is it would be Noah at center given his defensive prowess and Gasol at power forward given he can step out and shoot jump shots. That would leave Gibson on the bench as he seemed ready to take over a starting job from Boozer. But Thibodeau is not to be boxed in. He’ll likely make it a competition. So would Gasol be upset if he were the one to come off the bench? There’s plenty of time for three players with 96 minutes at the two positions and maybe the chance for someone like Gibson to steal a few minutes in a big man lineup. It also raises the question of who finishes. Thibodeau traditionally goes with defense to close games, which would mean Noah and Gibson. Would that upset Gasol? But with Derrick Rose back, he’ll be handling the ball and making the plays, and not Noah, who did so last season with Rose out. So then maybe you finish with Gibson and Gasol as you need offense and Gibson is a better shot blocker. How does Noah feel about that? But that also leaves the questions about wing play and shooting. And point guard. Well, backup point guard, anyway, behind former MVP Derrick Rose. Already, D.J. Augustin is being courted by a few teams and point guard salaries have escalated. Can the Bulls get Hinrich or Augustin back at a reasonable number and still have money for Mirotic? And then what about the perimeter? Can you start Mike Dunleavy again at small forward and Jimmy Butler at shooting guard? It would seem unlikely rookie Doug McDermott or second year player Tony Snell would be ready for a big minutes starting job or role. And it seems a glut at small forward with McDermott, Dunleavy and Butler probably best there. So can you trade for a shooting guard? With Gasol, the backup big man issue is resolved as Gasol is probably still one of the league’s top big men, but underused and at odds with coach Mike D’Antoni. 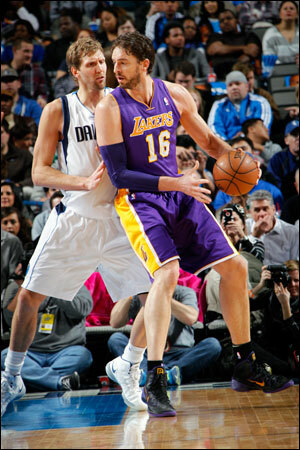 Plus, Gasol missed 55 games over the last two seasons with injuries, though he is said to be healthy now. He’s been criticized for his defensive play, but he proved to be a tough player in championship series and likely will be a better defender under a demanding coach like Thibodeau. His addition is big upgrade for the Bulls. Given the limited amount of salary cap room and limited interest in the players the Bulls would have considered dealing, the Bulls did well in adding a likely rotation shooter lottery pick in McDermott and top big man in Gasol. With the return of a healthy Rose, the Bulls scoring and perimeter shooting is much better with Rose, Dunleavy and McDermott. Their interior size is as good as any in the NBA. But they are not without potential problems and concerns. They should be serious contenders, though not favorites. It’s a nice start for the tall three and maybe even four with Mirotic.